With the United Kingdom’s Prince William and Princess Kate smiling out from magazine covers and television screens everywhere, it’s easy to forget that not that long ago – the late 1990s – only 32 percent of Britons told the British Social Attitudes poll that they felt positive about the royal family. Today, 75 percent of Britons agree the monarchy is integral to British culture. A lot changed, but perhaps the single most decisive factor is that the future of the crown isn’t the troubled Prince Charles, but happy parents William and Kate, sharing the joy of parenthood in the public eye. Put simply, William appears to be playing the role of the perfect modern man – strong but caring, balancing his commitment to his external duties and his love for his family, happily embracing his role as father and encouraging others to do the same. It’s not the gawky smile that has women around the world swooning – it’s his visible devotion. My co-author and I set out to assess and diagnose where some young and not-so-young men went wrong in our book Heavy Lifting: Grow Up, Get a Job, Raise a Family, and Other Manly Advice. 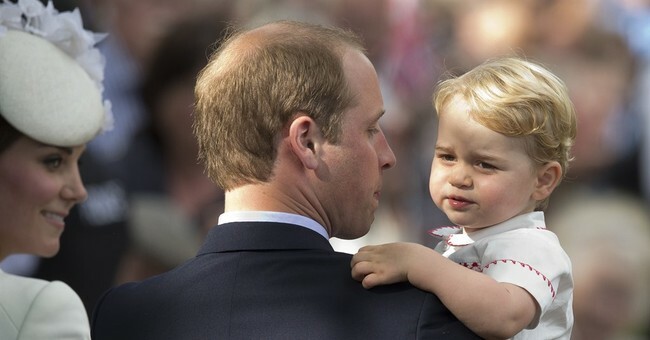 Prince William stands out as one of the growing number of celebrity dads who are determined to show how integral family is to their lives – even if their day job includes a heavy workload – you know, like running a kingdom. Sure, Prince William has a leg up on most men in that he’ll never have to worry about money, endless doors are open to him, and he was born with a clear career path. But his father’s life demonstrates that the advantages of monarchy can be squandered by a prince who bobbles the basic role of being a man. After losing his mother, Princess Diana, in his teen years, William had an easy excuse to become a royal “failure to launch” – to get lost in self-absorbed, aimless, laziness and immaturity. Instead, he made a conscious decision about what kind of man he wanted to be – the same choice available to every man at every age. William and Kate were an on-and-off couple over the years, but he knew when he was serious. When he proposed to Kate, he did it with his mother’s engagement ring. When their son George was born, William came out of the hospital carrying his infant son in a car seat. The world got to watch him put it in the car live – kudos to the prince for practicing how to install it beforehand! – before driving his wife and child home himself. Blissfully normal, like so many other new dads. In interviews, he jokingly lamented the sleepless nights with a new baby around, and said he wouldn’t get assigned the night shift in his piloting work. He joked about his difficulties with the first diaper change – and the increasing mastery that came with each subsequent one. The diaper-changing tales didn’t make William look wimpy; quite the opposite – comfortable enough in his own skin to take on the task, to do it, and laugh at himself when he didn’t do it well. That’s not weakness, that’s strength. The United Kingdom doesn’t need a monarchy; it has one because its people want to keep it. If the royals act like squabbling, selfish, spoiled brats, the country’s taxpayers will begin to see the institution as a giant, antiquated waste. Like his mother, William figured out how to put his status and public scrutiny to good use: he’s showcasing how to be a good man, husband and father.